I now own Musashi for like a month and had a number of battles in it. Though the battleships I'm most experienced with are the Americans (including Big Mamie), then the germans and thirdly the French. I do have Amagi and love the Japanese line too, but somehow I got an issue with Musashi. You see, since the NC, I love to brawl with my BBs. Even with her squishy broadside, I got lots of games where I felt near invinsible bowtanking with the NC. From those days on, you can find me at the front of the field trying to push capture points and tank damage as much as I can, as ships like MC, Massa, Gneis, Bismarck, Lyon, etc can handle that. I feel good in that role and feel that I need to fullfill that role when driving a Battleship. Even the Japanese I have commanded up till Amagi can push flags on some occasions. Now here comes my problem, or more a question. Almost all the games I try to push with Musashi, it ends up the same: me burning up as the biggest bonfire in history and then I'm on the bottom of the sea. How do other Musashi captains play her? What are your experiences with battles and situations with the this battleship? I have kinda convinced myself that this ship shouldn't be on the frontline even though other people always yell at Musashi/Yamato captains that they play too passively. Do you think that mindset is wrong? You’re a big slow target, you’ll always be focused. Just ask the poor Musashi I burnt to a crisp this morning in my asashio. You’re best bet in Musashi or Yamato is always stick with the fleet. Never ever be isolated. How do other Musashi captains play her? What are your experiences with battles and situations with the this battleship? I have kinda convinced myself that this ship shouldn't be on the frontline even though other people always yell at Musashi/Yamato captains that they play too passively. Do you think that mindset is wrong? They choose the right moment. Do not push too early or you cannot get to safety again. Watch the battle and find the right moment. 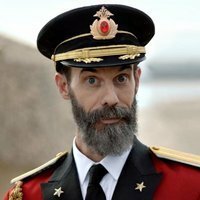 As long as at least one enemy is shooting at you, you are doing something right, unless you need a short break for repairs. Imo its just to work with your concealment - like with any other BB aswell. But if you play Musashi you have to be extra careful not to get enemies into your flank. Even a little too much side and they can citadel you through your cheek. If you are getting farmed by HE spam, and have no option to be undetected, id say you pushed ahead too early. If you have still backup around you that is. HE spam is never an issue for me when i play BB, and im not even going (full) anti-fire build most of the time. For IJN/US/RN i went with FP - but not on the german line. And even there its still managable in big fat GK. And ofc i use premium consumables and anti-fire flag - but nothing else like BoS. Your problem must be when you’re pushing in, the Musashi is no more vulnerable to HE spam then the NC. its main problem is high calibration AP thanks to the above water citadel and slow turret traverse. I'm a generally aggressive BB player, but I find I play the Musashi a bit more reservedly. As a rule, I try to play around or just above my concealment range (13.5 km with the optimal build) of any known or anticipated enemies. You're a huge target, and sometimes the only way to survive is to get back in concealment for a while. Also, with your huge, well-penetrating guns and weak secondaries, there's a weaker argument for getting to <12 km range. At 12-15 km you're likely to hold the advantage. That said, I think there's never much sense in playing outside 15 km, in any BB. You just hit better from closer up, get better cover from your friendlies, and are in position to receive an acceptable amount of fire, thus taking the pressure of your team's DD's and cruisers. All of the above assumes my team's DD's and low-concealment cruisers are doing THEIR job, and are playing ahead of me, just around their own respective concealment ranges. I generally wouldn't push first. What are your experiences with battles and situations with the this battleship? Step 2- when You see a nice spot with many juicy targets and the chance to keep your flanks/broadsides from getting involuntarily penetrated, it's time to steam ahead, all guns blazing, sticking shells in each and every enemy ship that makes the mistake to get into your line of sight. YOU HAVE 26KM RANGE DO NOT PUSH I REPEAT DO NOT PUSH. DDS HAVE 10km RANGE AND THEY WILL HAVE TO PUSH!, same for cruisers just little more range. Only one? Last week I burned down two (in a division, so were they...)... They sailed in a pair too... their biggest fault: they returned fire. Kept shooting. He finished one, the other one got burnt down totally. Easy >100k for me, do not play the Musashi that way (as I now have a Lion...). Once burnt a Yamato, for about 125k. with Kutuzov. Made one very angry Italian salty. Felt good. Made one very angry Italian salty. I'm still bery much learning and experimenting with the Musashi myself. It's a great ship. My default opening gambit - especially when top tier (about 1 in 3 battles) is to go to the centre of the map, preferably between 2 cap circles and with a bit of island cover. And then pretty much park there and try to project Yamato class naval power. This all depends on the map, starting position, map mode, how the game progresses, what's happening on the mini map. It's nice to be close enough that your guns don't troll you too much and are trolling the enemy more. And you don't want 5 ships focusing you down in less than a minute. But you do want, ideally, to tank some damage for your team early on in the battle. Whilst also not getting torped, by being aware of likely threats. Sometimes you might be left defending against an overwhelming force. In this case, kiting away and shooting over your shoulder whilst fiddling with the throttle and rudder is good for frustrating the enemy. Good luck pushing forward early on in the Musashi. It always gets focused on with fire once in range of enemy guns. Wrong ship for your play style really, as you just won't be overlooked once spotted because it's big and slow. It also poses a big threat with those BOOM guns, the other team will try and take it out fast when they can. Bismarck and Gneisenau suits me better as I always get impatient and too aggressive! The 1st rule of BB club is not to park in a BB. When you park and/or reverse, you become target number 1 since its way easier to hit a slow or stationary target. Personally I push forward and try to keep myself moving inbetween 2 caps at the start of the game. If I have no support or there are way too many ships, i turn back. Short term i lose a chunk of HP for showing my sides, being alone etc. Long time i survive. Imagine parking at a spot and 6 enemy ships push you. You'll become fish food. The benefit of moving is you reposition yourself throughout the game, flank enemy lemming trains, punch through their lines. So yeah try not to park. This tactic works so well, he (Lin3) had to make his profile private because he got focussed a lot being superunicum. It's easy to hit a Musashi going at full speed and playing with the rudder like hell. It's a huge, not very fast ship with a slow to shift rudder. The Musashi tends to become target number 1 when there are no suitable DD or cruiser targets, nor closer or broadside BB's for them to shoot at. It depends what's shooting at you. If it's BB's shooting AP you want to be properly angled at all times. As you've said yourself when you turn back you lose a chunk of health because you are showing your broadside for a Jingles paddling. And as I said, it all depends on things like what's going on on the mini-map. So, very often, what starts as a basic opening gambit of parking in the centre of the map with some island cover, turns into something else depending on what will give your team the best chance of winning. It's this WoT like obsession with player stats that made me hide my stats as soon as I could in World of Warships. Please feel free to guess what my overall win rate is and what my win rate in the Musashi is (small sample size). I love that ship, she is awesome! but before that, let me post my musashi stats.. take a look at them.. then read below! First of all, I do not bow tank like the majority.. I don't like that play style even a little bit. So, I usually, go behind some cap.. always on top speed.. I try to stay around 10 to 12km from a cap.. that makes me around 15km away from enemy cruisers, and 20 to 22km away from general BB population..
O sail one side, then start sailing back.. like patrolling behind a cap or two.. in an angled zig-zag..
and always keep an eye for broadside or overangling opportunities.. Yes you can overpen everything but mid to long range, Musa guns tend to misbehave sometimes..
this one zigzag tour usually takes around 10 mins..
then you need to look around the time to push.. If I am on the off side, I.E. enemy lemming trained to the other side.. I go in cap, and turn my bow towards the other side.. or try to push behind them.. If enemy lemming trained towards my side.. I try to keep my distance..
For me the the main idea behind my play is.. always try to keep people in around 15km.. If you have a tier 9 or 10 CV in the game..
and never leave her side..
Because an alone musashi is even a better target than a bismarck to a midway.. The Musashi I find should be played like the Nelson for instance. You cant tank the same way in both ships - never! Musashi can bowtank vs all BBs except Musashi/Yamato, while Nelson gets frontal Citadelled by so many BBs, that you have to know whom you can bowtank and who not. Its a must to have a slight angle in Nelson vs those BBs (or simply not engage them 1v1). Nelson can too punish other BBs, but the others can do it faster to him because of the huge citadel. I do the same thing in my BBs... usually they have better stealth than Musashi. OK usually they don't overpen anything and hit like wet cupcakes but hey. You might just find a parked Fat Freddy/Currywurst/Yamasashi while on patrol... I usually do. I guess I prefer to be mobile so that I can a) support my teammates and be their meat shield while we push and b) If they're not pushing I can move away and reposition myself to help other allies who are doing something. I don't really enjoy static game play that much in WOWS. As good as Flamu is, he sometimes tend to just hang at the back and snipe. I think I've mentioned it before several times, but there was a video of Flambass playing in a Yueyang against Flamu and Runner in a Montana and DM respectively. Flaumu, his clan mate and several other BBs outnumber Flambass's team on that flank. Yet they all did not take advantage of that numerical advantage to push. Flamu just hung around at the back lobbing shells and played too safe and I would say in part, contributed to their loss. Eh well at least he is trying to learn compared to alot of other people. Indeed. However I know what your stats are like in the Yamato and Musashi. You don't know what my stats are like in the Musashi. So you don't know which of us has a better understanding of how to win in this class of battleships. Also, I would never criticise Flamu's gameplay. He's a significantly better player than me - and indeed the vast majority of people reading this. My only direct experience of Flambass was about 18 months ago, when I killed him in the first 3 minutes when he was over aggressive in the tier 7 Leningrad and I was in the tier 5 Omaha, which then set us up for an easy win as their team collapsed without him. One battle in which he was testing a new to him ship does not make him a bad player. Just as one battle from Flamu does not make him a sit at the back sniper. The point here being that even the best players have off battles. That still doesn't stop them from being great players whose advice should generally be taken. Cheers for the replies guys n girls. I really appreciate it. I'm probably a bit impatient most of the time. I'll try some of the more patient tactics, certainly around the first bit of the match. The biggest problem I have with the Musashi is that I tend to start the game on one flank and my team decide to lemming to the other flank. 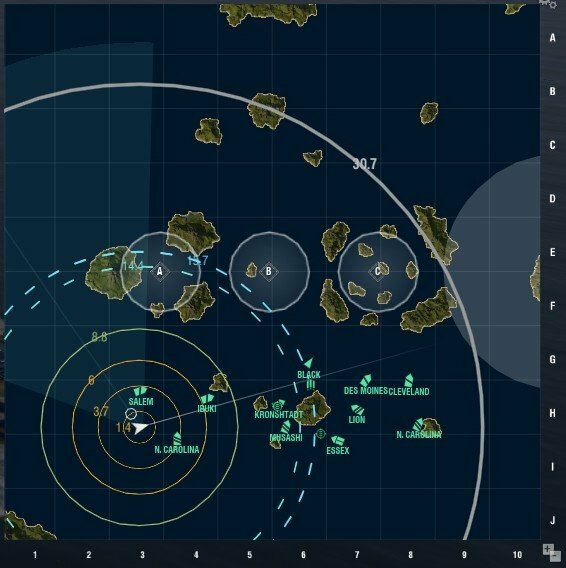 In this game my team headed for C (though most of them ended up behind the islands on the 9 line). The reds came through A and a lone DD capped B.
I headed to C then started to push B but got TK'd.